Two Thumbs Up For "Rio"
I enjoy animated movies like Shrek, Ice Age, Cars, Finding Nemo, Up, and Madagascar, so it is no surprise that I enjoyed the latest movie Rio whose main characters were parrots. I think the only part of the movie that made me want to jump out of my seat screaming "Nooooooo!" was the scene where Blu was given chocolate chip cookies and hot chocolate with marshmallows. It was at that part that I wished I had a bullhorn so I could shout out "Please do not feed your parrot any chocolate - it will make them sick!" to the entire audience in the theatre, but...I didn't want to embarrass my son. What I didn't expect was to watch a movie that had a good message to deliver in an entertaining way. This could have been a purely funny, zany story like Shrek, an animated romantic comedy. This too had the potential to be an animated romantic comedy between two macaws, but found Rio to be so much more. There was painstaking realism within this fictional story, not to mention the moral that hit home with me, that it left me with an ache in my heart at times. The movie began with poachers interrupting the happy, carefree lives of the parrots. Blu, the hatchling macaw was trapped and shipped to the United States. The poaching scene is a situation that many are still battling in foreign lands so I appreciate the taste of reality fed to family audiences. Rio also portrayed a loving, caring bond between human and bird based on trust. Many birds are loved and cared for - not ignored and neglected. Unfortunately, we tend to focus on the wretched stories of hoarders, sub-standard bird mills, etc, that we forget that many birds are loved, well fed, and happy. Then we are shown the flip side of the coin that many do not know about…those who regard birds as a commodity rather than distinct living beings. We are shown a gang of unscrupulous thugs who market stolen birds to line their pockets with money. Rio is more than a charming love story between two endangered macaws, it exemplifies how we should and should not treat living beings. One can admonish this movie and state that many who see it will run out to purchase macaws thus increasing the homeless bird population years from now. The first hitch in this scenario is that macaws are not cheap; therefore, many will not be able to afford to run out and buy one, especially one that is on the endangered list. Second, breeders cannot produce birds on demand. If they could, many birds would not be on the endangered list if it were that easy to raise numbers. You can mass produce DVD players and iPods in short time. Nature, however, is not flexible enough to accommodate our whims with the same efficiency. If one wants to skip my analysis of Rio, I will simply say that I enjoyed the time spent with my family watching what we enjoy...an entertaining animated movie. My family and I give Rio two thumbs up. The song "Be Our Voice" was written within two weeks of seeing photographs of the largest animal cruelty case in history on the Harris County Attorneys Office Facebook page. I wrote it for my own peace of mind. I had to untie the knots in my stomach created by those pictures, and writing "Be Our Voice" was the therapy I needed. Soon thereafter, I stumbled upon an ASPCA announcement with Sarah McLaughlin singing and narrating it. So why not take "Be Our Voice" to the next logical step...an animal cruelty prevention video? But I would need a celebrity to narrate it. I had a few in mind, but one name continued to tower above the others because of her respect for both animals and nature. Sy Montgomery, national best-selling author and naturalist, wrote her own narration to provide scientific facts with sensitivity, and created a plea for a call to action as a result. But before I could create this video, I needed the photographs that inspired this entire project. This project would be meaningless without them for this was what the project centered on. I contacted Linda Geffen, the Chief Prosecutor on this case at the Harris County Attorneys Office in Houston, Texas. I was granted permission to use the evidence photos for the video. So I waited to release this video until the appeal had been heard and the trial ended with a verdict. I expect mixed reactions to my project...mostly due to political conviction. Those who favor human rights may have a very different opinion than those who favor animal welfare. Because this project came from my own heart, the song and video express what I hold in my heart as my personal belief without sway from political sentiment. I have been reading posts on many lists about the Houston, TX bird seizure case (Gracia'). I am saddened, but more, I am angry, to see that SOME of the members of our society have regressed to the point where SOME of ...you think that "VIGILANTE JUSTICE" is preferable to the DUE PROCESS which is supposed to be GUARANTEED TO ALL OF US under the U.S. CONSTITUTION. Maybe you haven't regressed. Maybe you were never educated about DUE PROCESS in the first place. Perhaps you fell asleep in civics class and never read that document. Or maybe you just don't care, because you are perfect and YOU KNOW that YOU will never be subjected to an illegal search or seizure, and that YOU will never have your civil rights violated by any quasi or real agents of our government. Regardless of your excuse, your online comments show that you have no concept of what DUE PROCESS is, or of how it is supposed to protect all of us against the evils of an overbearing government and its agents. TO THOSE OF YOU WHO ACCEPT VIGILANTE JUSTICE - YOU ARE TODAY'S KU KLUX KLAN. "We know they're guilty, we've seen the photos posted online - why bother with things like the Constitution, warrants, courts, sworn testimony, trials, or appeals? JUST HANG THEM NOW, AND GET IT OVER WITH ..."
This is my personal comment to each and every one of you who has convicted the Gracias in an "internet trial" simply because you have viewed some photos posted online - SHAME ON YOU. To those of you who believe in VIGILANTE JUSTICE and "internet trials" - good luck finding an attorney willing to defend you pro bono when it's your turn to be the accused. Yes, vigilante justice is a very real thing. When people witness events or horrors that are outside the scope of what is considered socially acceptable, they want heads to roll. Some examples: the recent BP oil disaster in the Gulf, Michael Vick and other dog fighting incidents, repeat drunken driving offenders who end up killing an entire family in a car crash with a blood alcohol level of .21, pedophiles released from prison to destroy another child's life. If a mother leaves her three year old daughter alone in her house for three days so she could spend some time alone with her boyfriend at his place, the public will become outraged at the selfish behavior of the mother. The daughter is still alive because she was eating some of the dog food left in the bowl to sustain her. The daughter is found roaming in front of the house in a three day old soiled diaper, the dog is alive because he has taken to eating his own feces from the carpet in the living room. But the defense can argue that no harm was done because they are both alive. But is this acceptable? Should the mother be allowed to keep custody of this child or the dog for that matter? Now look back at the pictures. People defended the condition of these animals as directed by the defense. " No harm done." The diseased bird with the overgrown beak was shrugged off as being acceptable. Those in defense of this cruel and neglectful act threw up their arms and cried "What's wrong with that beak? There's nothing wrong with it. It's NOT animal cruelty." It was ok that this bird existed like this with no way out, no visit to the vet for medical treatment, no hope for anything different because it knew no other existence other than this. This was life and these animals accepted it because they had been bred into it. If you know nothing else, you expect nothing else. So no harm done. Yes, Genny Wall, there is vigilante justice. There always will be as long as outrageous, inhumane, and socially unacceptable "crimes" continue without courtroom justice. New laws are created to set standards for what is socially acceptable and humane. There is a saying..."A picture is worth a thousand words." For those whose voices went unheard in the Gracias' home, the pictures spoke volumes on their behalf. A very warm thank you to Mitch and Catherine at Windy City Parrot (Chicago, IL) for the wonderful deal on three new macaw cages! Bird Lovers Only Rescue is having a GARAGE SALE in order to raise funds to purchase three new macaw cages. 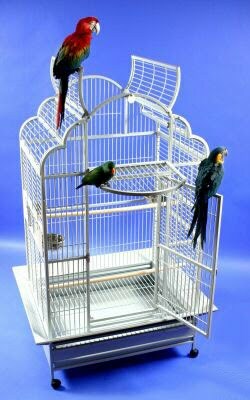 We have approximately 30 parrot cages, travel cages, and stands ranging in size to suit small birds (parakeets, cockatiels, conures) up to large birds (cockatoos). Prices range from $15 to $300. The TASC Midwest Bird Expo 2010 was a huge success as always. We ran into some terrific old friends, and made quite a few terrific new friends as well. Sy Montgomery, author of "Birdology" which had a chapter on Snowball, sat at the booth next to us. Patricia Sund of Bird Talk and Parrot Nation joined our cozy group and wowed us with her talents for cinematography and feather scarves! There's a lot of creativity in that young lady! We were also lucky enough to be placed next to T-W Birds so I was able to meet Traci LaMon in person. A very big thank you to Traci of T-W Birds for all the toys for our rescue birds! Irena Schulz presented the Music Therapy Studies on parrots, but was upstaged by a funny, dancing bird...none other than Snowball the Dancing Cockatoo. Here is a short clip of him dancing to Lady Gaga's "Bad Romance" at the close of the presentation. We hope to see you at next year's Midwest Bird Expo. Please be sure to visit Bird Lovers Only Rescue to receive our brand new t-shirts and books in return for your donations. Your support helps fund our continuous efforts to rescue, rehabilitate, and adopt out parrots as well as allow us to further understand parrots through research studies. Thank you! Two years ago Jorie Gracen of the PondHawks sent a CD for Snowball to dance to. He immediately took to "Crying Hyena." He didn't even need to hear the song twice like many of us do in order for a song to grow on us. I pressed play, turned around, and there he was dancing away already! Snowball picks the tunes. And there's something about the PondHawks that he definitely likes. Is it the vocals? The melodies? The beat? Maybe it's a combination of all those things. Snowball knows what he likes. The PondHawks latest CD is receiving worldwide recognition. And why not? After all, Snowball gave it his seal of approval. One can watch the You Tube video of him rockin' out to "Crying Hyena" here.